Welcome to the August issue of Weight Watchers magazine! This month we’re embracing our bodies – wobbly bits and all! 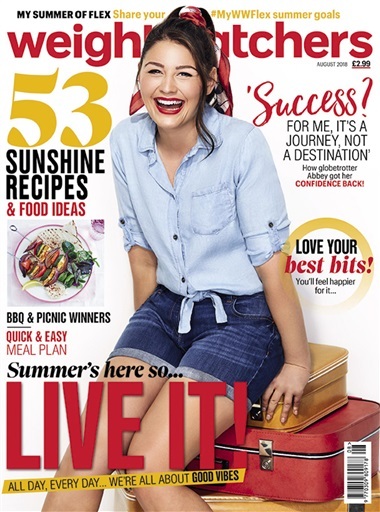 Whether you’ve got a summer getaway planned or are crossing your fingers for a bit of British sun, this issue is all about finding the confidence to go out and rock your new summer wardrobe. Forget baggy t-shirts and floor-length cover-ups – this is your time to shine! We catch up with cover star Abbey who’s lost 1st 1lb and learned to live a healthier life – all while juggling work, a hectic social life and holidays abroad. Plus, five gorgeous members shun negative body talk and celebrate the bits they love about themselves. And, twins Lindsey and Kirsty talk support networks, sibling rivalry and how a combination of the two helped them get healthy. Summertime means picnics, barbecues and fresh flavours and we’ve got all three covered this month! Dreaming of a getaway? Bring a taste of the Caribbean home with tropical-inspired recipes. Or, celebrate the best of British with three delicious ways with berries. And if that wasn’t enough, the WW Kitchen team share their best new ideas, including homemade gummy sweets. Our expert stylist takes a tip from our inspirational members with a round-up of on-trend styles to flatter your best bits. And if you’re worried about a fake tan disaster this summer, our guide will help you glow like a pro. Plus, we’ve got expert advice on learning to love your body, how to stay fit on holiday, and why you should switch off like a celeb this summer.